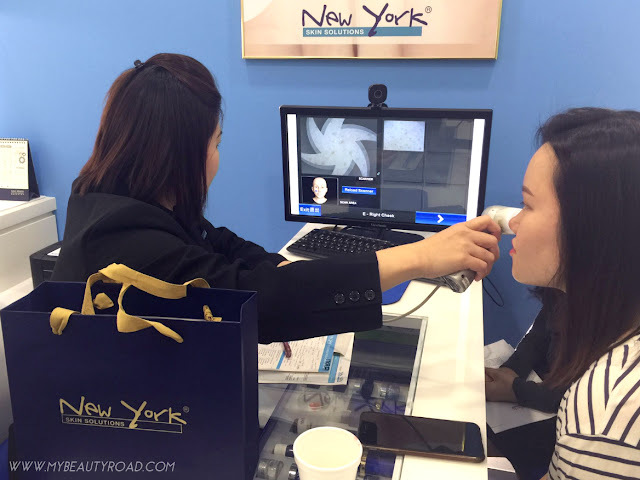 My Beauty Road | Singapore Beauty Blog: My first trip to New York Skin Solutions | REVIEW + Link to free $300 facial! "Makeup is a supplement; skincare is a necessity." My first trip to New York Skin Solutions | REVIEW + Link to free $300 facial! I apologise for the lake of updates on this space (although I'm still active on Instagram - follow me at @mybeautyroad if you have not!) because I've got so much on my plate. I'm back now for another facial review! When I came back from Taiwan in October, my skin was not in its best state. The strong winds + blazing sun + low temperature (yes, it was all 3 at the same time) made my skin confused - I mean, even I was confused! Knowing my own skin, I wasn't surprised that it reacted adversely. I had dry patches around my nose and in between my eyebrows, while the rest of my face was clogged. 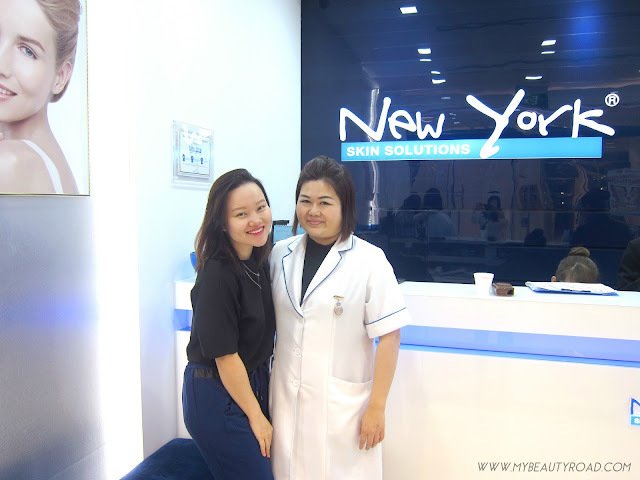 Thankfully, I had already made an arrangement with New York Skin Solutions to have my first facial appointment with them right after I came back from Taiwan (I know my skin too well), and I was so glad I did. 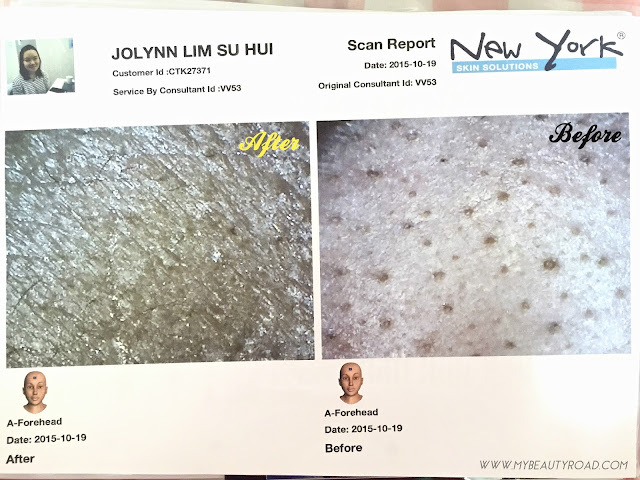 The unique feature about New York Skin Solutions is their professional Skin Analysis device which shows you (and your skin consultant) your skin problems - not just on the surface of your skin, but deep into the dermis layer. I find this so important because what you see on the surface may not be a true reflection of all that's going on deep inside your skin. A classic example is oily skin on the surface; it's usually because your skin is extremely dehydrated inside - a total opposite! My cheek area did not look so clogged on the outside, but just look at how clogged it was beyond the surface. I could only imagine how clogged my whole face was! 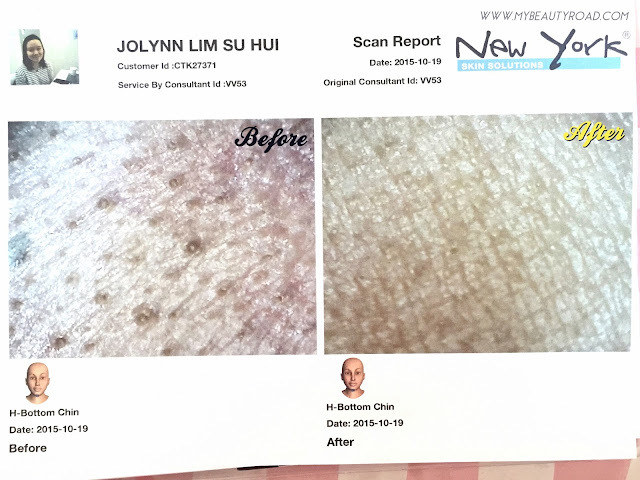 But of course, I didn't have to imagine because Ada, my therapist and Supervisor of the Ngee Ann City outlet, scanned my whole face and patiently explained to me my skin condition. Ada then customised a collagen facial treatment that caters to my skin type and concerns, so off we went to the treatment area! Me and the awesome Ada! I love how she is like a 开心果 a.k.a happy-go-lucky person. Next step is what New York Skin Solutions call the Oxygen Mask. 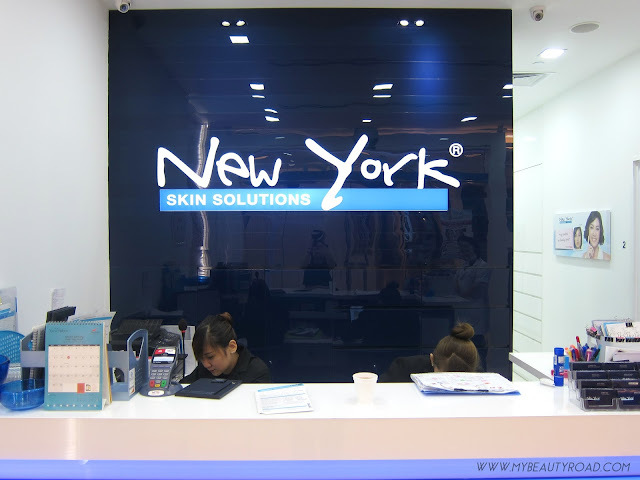 There has been a debate about whether or not it is a good thing to use warm steamers prior to extractions, so in a way it relieves me to know that New York Skin Solutions chooses the safer route and uses a softener (coupled with a cooling oxygen machine to hydrate the skin) instead. Ada was very meticulous when extracting my impurities. She really took her time to examine my skin and extract all the nasty gunk lying underneath the surface. She warned me that my skin would get really red because I have very sensitive skin, but I told her not to worry and go ahead with the thorough extractions - I am already used to the redness with all the facials I've gone to this past year. Nonetheless, I appreciated the fact that she informed me, lest I got shocked at my own tomato face! I also love how a layer of antiseptic was applied for my skin's sensitivity after the extractions. 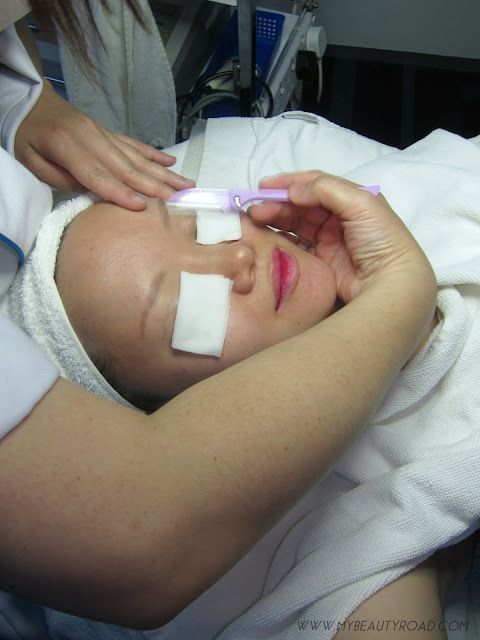 Next, it was time for the signature step of this facial - the Collagen Treatment. A collagen gel was applied onto my face with a brush. Ada then used a machine which applies Ultrasound waves to better stimulate the collagen gel into the dermis layer of my skin. I truly love how my neck was not neglected - yay to more collagen! A facial point and shoulder massage followed. Once this pampering massage was over, it was time for the Double Mask. If you have read my previous blog entry, the term "double mask" will not sound foreign to you. It is basically 2 layers of mask at a time. This part is totally customisable according to your skin. I got Honey Mask for my first layer to repair and provide moisture to my skin, and a hard mask with soothing properties for the second layer to soothe away my post-extraction redness. Here is how my skin looked after 20 minutes of Double Mask. The redness on my skin significantly subsided, and my skin looked a lot more radiant (thanks to the collagen treatment and Ultrasound)! Those lines in the "after" picture (right) are a good indication of increased collagen and hydration! The difference on my forehead is shocking. Again, look at those lines in the "after" photo (left), which were clearly not present in the "before" picture. 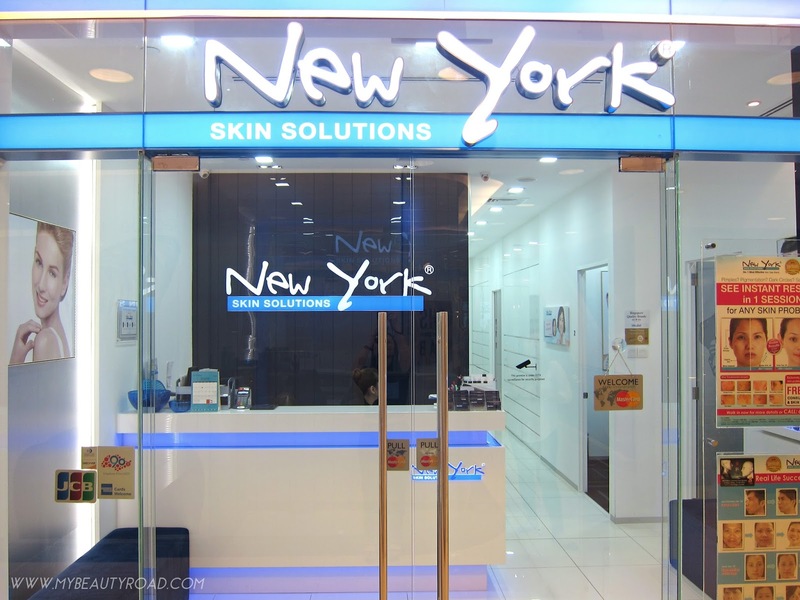 With my above review and testimonial, don't you want to give New York Skin Solutions a try too?? Well, YOU CAN, AND FOR FREE! If you are skeptical about trying New York Skin Solutions out (to be honest, I would be too, because a company that focuses a lot on marketing will usually focus on hard-selling as well), please fret not as I've been told this: If you have signed up for a package and for some reason felt like you regretted paying (maybe you felt like you were being forced to sign up - which hopefully isn't and shouldn't be the case - or maybe you just felt like it was on impulse), New York Skin Solutions will refund you straightaway. This is such a wonderful way of gaining the trust of customers, and I truly applaud New York Skin Solutions for this implementation. Disclaimer: I have been generously sponsored 10 facial treatments by New York Skin Solutions in exchange for a blog review. While this post contains factual information from the company itself, thoughts and opinions expressed above are strictly my own. I am neither compensated by nor affiliated with the company. Follow me on Instagram @mybeautyroad for more beauty updates! Nice post about New York Skin solutions review. Found it informative. "I've been told this: If you have signed up for a package and for some reason felt like you regretted paying (maybe you felt like you were being forced to sign up - which hopefully isn't and shouldn't be the case - or maybe you just felt like it was on impulse), New York Skin Solutions will refund you straightaway." You have been told by? Is this true? Hi, how can I contact the head of PR? Thanks! Hello! I'm afraid it has been 2 years since I last visited NYSS, so I've no clue who their current PR company is :( Sorry! Hi Jolynn, i'm happy to hear about your experience at NYSS. Initially I was nervous because I read some reviews that were bad. I went there yesterday for facial after seeing their promotion in FB. Frankly speaking, I find their service must have improved a lot over the years because I didn't feel hustled like some of the blogs claimed. I strongly recommend people to go NYSS for common skin issues and give it a try before making a judgement for themselves. Just because you can't afford it, doesn't make something bad. 25 // +65 Sunny Singapore ☼ Don't forget to love yourself. My Beauty Road. Awesome Inc. theme. Powered by Blogger.